"Spend a few hours with us and meet some new friends. 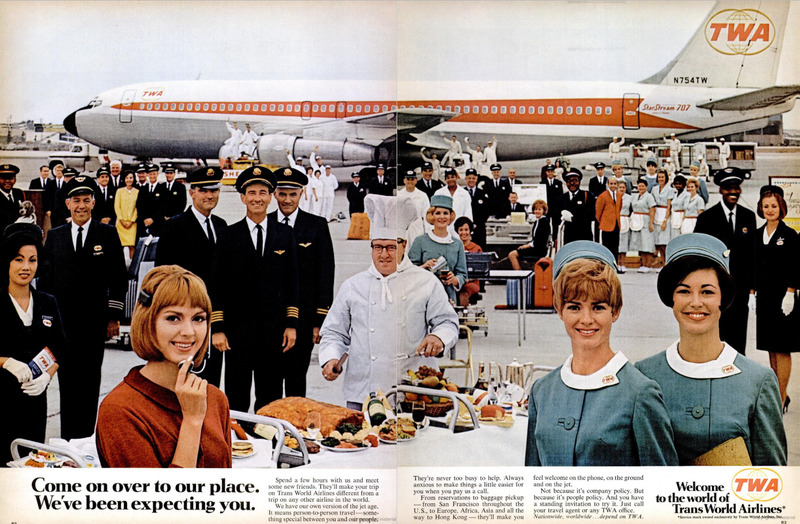 They'll make your trip on Trans World Airlines different from a trip on any other airline in the world. We have our own version of the jet age. It means person-to-person travel - something special between you and our people. They're never too busy to help. Always anxious to make things a little easier for you when you pay us a call. From reservations to baggage pickup - from San Francisco, throughout the U.S., in Europe, Africa, Asia and all the way to Hong Kong - they'll make you feel welcome on the phone, on the ground and on the jet. Not because it's company policy. But because its people policy. And you have a standing invitation to try it. Just call your travel agent or any TWA office."